‘Never a dull moment’ has been Israel’s motto since the establishment of the state in 1948. With May coming to an end we had two mini-wars this month and next month could see a big one if diplomacy should fail. The two mini-wars in May, the one that took place in the night of May 10 between Iran and Israel in north Israel and this week’s confrontation between Hamas, Islamic Jihad and Israel, showed similarities which revealed that the Israeli military has a new strategy. Just like the direct confrontation with Iran on May 10, when the Quds Force of the Iranian Revolutionary Guards Corps lobbed 32 missiles at Israel and the IAF destroyed 50 Iranian targets in Syria in response, the army did the same with Hamas and Islamic Jihad this week. 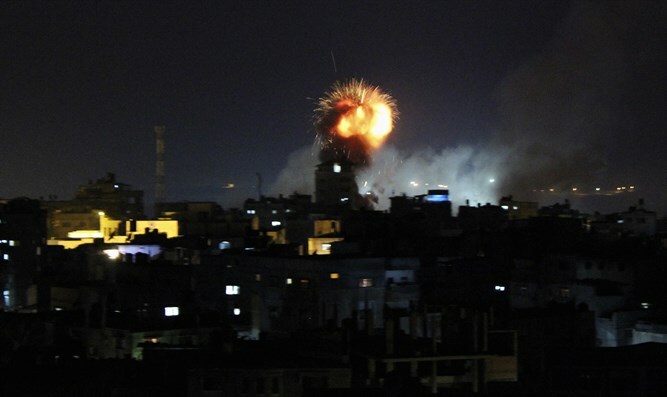 On Wednesday night, the IAF destroyed much of Hamas and Islamic Jihad’s military infrastructure in Gaza when Israeli warplanes and combat helicopters destroyed 65 military targets in the coastal enclave. "Israel sent a message that if attacks begin again, the attacks on Hamas and its offshoots will become more forceful. Now, actions will decide what the future holds," a senior Israeli defense official told Arutz Sheva. Hamas and Islamic Jihad, or should we say Iran, apparently got the message and asked Egypt for help in order to establish a cease-fire. Both terror organizations are considered part of the so-called ‘resistance front’ - the loose coalition of Iranian-backed terror organizations and Shiite militias which are taking their orders from Quds Force commander Qassem Soleimani of the Iranian Revolutionary Guards Corps. The shrewd Iranian general has virtually overseen every major battle in Iraq and Syria since the rise and downfall of Islamic State and also tries to prevent the forming of an anti-Iranian coalition in Iraq after the May 12 parliamentarian election. Soleimani was also responsible for the establishment of a land bridge which connects Iran with the Mediterranean Sea and southwest Syria where Iran tries to encroach on the Israeli border. He will no doubt play a similar role in the coming offensive against rebel groups in the Kuneitra and the Daraa provinces which border on Israel and Jordan and the pro-Assad coalition appears determined to re-conquer the region. These areas are part of the so-called de-escalation zones which were part of the July 2017- agreement between Russia, the United States and Jordan. The news about the military build-up in Kuneitra and Daraa has led to a flurry of diplomatic activities and to the forming of a new Sunni Islamist dominated fighting force of 30 thousand men. Last week, the U.S. State Department issued a warning against breaching the de-escalation agreement and said it would take “firm and appropriate measures” to ensure the Syrian border with Jordan and Israel would remain free of Iranian proxy armies. This was followed by what seemed to be a fake-news report about back-channel negotiations between Israel and Iran about the issue in a hotel in Amman, Jordan. Channel 2 in Israel later reported Israel had reached understandings with Russia about the prevention of any Iranian presence on the Syrian Golan Heights. Russia and Israel reportedly agreed the Syrian army would be the force controlling the area along the Syrian Israeli border whenever the rebels would be forced out of the region while Russian would ensure no Iranian troops and proxies, including Hezbollah, would be allowed to set up camp in the vicinity of the Israeli border on the Golan Heights. The Channel 2 report also suggested Russia would continue to ignore Israeli attacks on Iranian facilities and bases in Syria. Israeli Prime Minister Binyamin Netanyahu effectively denied the first part of the report when he wrote on his Twitter account Israel would not agree to any Iranian military presence in all of Syria. “The long-range missiles Iran is working to station in Syria will endanger us even beyond the range of several kilometers from southern Syria; therefore, Iran needs to leave Syria altogether. We’re not party to understandings to the effect that we have agreed to less than this,” Netanyahu wrote. The Israeli leader on Wednesday repeated Israel preserved the right to act in all of Syria against Iran. "We will continue to act against (Iran’s) intention to establish a military presence in Syria, opposite us, not just opposite the Golan Heights but anywhere in Syria," Netanyahu was quoted as saying by the Russian news agency Sputnik. Russian Foreign Minister Sergei Lavrov on Wednesday repeated Putin’s call upon all foreign troops to leave Syria including Iran. Lavrov said the withdrawal of foreign forces in Syria should be a two-way street, meaning not only Iran and Turkey needed to leave Syrian territory but the U.S. as well. Moscow is apparently concerned the continuation of Iran’s encroachment on Israel’s border could trigger a major war between the IDF and the Iranians and their allies. The chances such a war could break out if Iran doesn’t back off are growing by the day. Iran has already rejected Russia’s appeal to withdraw its forces from Syria. “No one can force Iran to do anything. As long as terrorism exists and the Syrian government wants, Iran will have presence (in Syria),” Iran’s Foreign Ministry spokesperson Bahram Qasemi told reporters. Israel, meanwhile, is apparently not convinced diplomacy will solve the matter. Netanyahu dispatched Defense Minister Avigdor Liberman to Moscow where he held talks with his Russian counterpart Sergey Shoygu. Russia understands Israel’s security needs, the Israeli DM said after the meeting but didn’t elaborate. The Russian army in Syria and the IDF operate a hotline to ensure IAF combat missions in Syria do not conflict with actions of the Russian air force. While Russia has the ability to shoot down IAF planes operating in Lebanese or Syrian airspace by using its S-300 anti-aircraft missile system it has never tried to activate it against the IAF and apparently plans to continue this policy. Another sign Israel is concerned Russia will not be able to contain Iran in Syria are the increasing IAF over flights in Lebanon. Not a day goes by without Israeli reconnaissance flights in Lebanese airspace and the IAF is almost daily striking Iran-related targets in Syria from Lebanese airspace. “The enemy is always in our skies,” Hezbollah leader Hassan Nasrallah said last week. On Tuesday IAF warplanes again attacked Hezbollah bases in western Syria killing a large number of pro-Assad fighters including a high-ranking Hezbollah commander. In southwest Syria, meanwhile, rebel groups have no intention to leave the area along the border with Jordan and Israel despite warnings by the pro-Assad coalition they have only two choices: death or surrender. The rebels have formed a new coalition of 30,000 fighters which operates under the name National Liberation Front and they have begun to attack Syrian army convoys in Daraa. The pro-Assad coalition, on the other hand, continues to prepare for a large scale offensive against the rebels. “The Daraa-based al-Banyan al-Marsous operations room monitored an uptick in the movement of Syrian government forces and military equipment over the past week. An FSA spokesperson in Quneitra province, west of Daraa, said his faction observed similar mobilizations near frontlines there,” Syria Direct reported. What about Iran and Hezbollah, you might ask. First of all, Assad’s forces ceased to be the ‘Syrian army’ a long time ago. As Sunni conscripts increasingly refused to enlist in Assad’s army, Shiite mercenaries filled its ranks while Hezbollah became an integral part of the Syrian army at the beginning of 2017. Secondly, Hezbollah and Iran are taking their own measures to ensure they remain close to Israel’s border. Channel 1 in Israel reported on Wednesday Hezbollah terrorists in southwest Syria have now been spotted wearing Syrian army uniforms.